Have you seen the NIGMS image gallery? We’d love to feature your work there. The gallery contains photos, illustrations and videos that showcase NIGMS-supported science. It’s a place where teachers, students, journalists and even I go to obtain images that help people understand and appreciate biomedical research. If you have interesting or striking images or videos created with NIGMS support, please e-mail me! We prefer entries without copyright restrictions (i.e., never published or for which you retain the copyright). Images in the gallery are freely available for educational, news media or other informational purposes. You might also consider entering the International Science & Engineering Visualization Challenge sponsored by the National Science Foundation and Science. Entries, which are due by September 15, can include photography, illustrations, informational posters and graphics, interactive games and non-interactive media. They can be pedagogical, playful or just plain pretty. Winning submissions will appear in a February 2011 issue of Science and will be featured online by Science and NSF. Let me know if you win, so NIGMS can feature the image, too! I have judged this competition for the past 2 years and can give you more details if you’re interested. Last week, I attended the PI’s meeting for the Joint DMS/NIGMS Initiative to Support Research in the Area of Mathematical Biology , a program managed by us and NSF’s Division of Mathematical Sciences. A key goal of the program is to bring mathematicians and new mathematical approaches into the core of biological and biomedical research. I was a grantee of this program before I came to NIGMS, so it was interesting to see how the program has evolved and to meet other scientists finding synergy between math and biology. During the two-day meeting , researchers and students supported by the program shared their experiences, exchanged ideas and explored new collaborations in the field of mathematical biology. Their oral and poster presentations covered a spectrum of topics, from protein and RNA structure prediction to modeling biological complexity and statistical inference. The meeting also featured six brainstorming breakout sessions that helped the program officials identify future opportunities and challenges for the field. Several speakers emphasized that the quest for stimulating the innovative use of mathematics should not undermine the application of well established mathematical approaches in biology. Dynamical systems theory, which describes how complex networks change over time, suggests that the architecture underlying a biological network’s control system may have been evolutionary selected to support the delicate balance between robustness and efficiency. Methods for studying the spread of infectious diseases could also be used to study the spread of emotional states (depression, happiness, etc.). 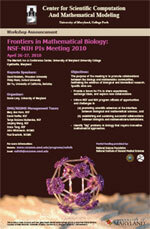 If you are interested in mathematical biology, visit the meeting Web site—it will be updated soon with the meeting abstracts, slides and photos. If you would like to apply for funding for mathematical biology research, look for an announcement about the program’s next solicitation on the Feedback Loop around the end of July.